Can someone educate me on how Princess stoves work? It's a new-to-us boat. On the left side, there's a switch for TOP BURNERS (in the up position) or OVEN (down position). So I figured only one worked at a time. Had a couple of drinkies and while the potatoes were cooking in the oven, I put the broccoli on to steam on the burners. BOTH are working. So what is the point of the switch? If someone could educate me on this oven/stove, I'd appreciate it. There are a lot of different Seaward Princess stove/ovens out there. You'll need to find the model. I have a manual, PM me if you want a copy. It's really pretty entertaining. 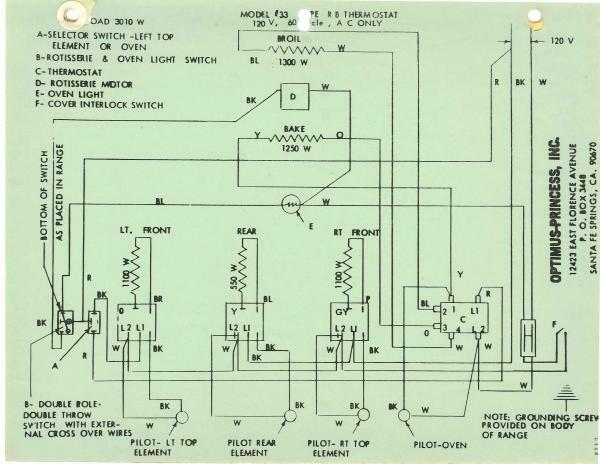 It also includes an electrical schematic. The switch allows you to use the Left top element, OR the oven. You can't use those two at the same time. The right element always works, and the back one is a "warming" element only - you can't boil water on it. If you take all the elements out to clean, make sure they go back in the right place! All of this complexity is to keep the overall current draw low enough that you can use this thing on a 30A shore power circuit, and still run other lights and appliances. I had a 110 VAC version of this stove which I think is what you have. I no longer have it in the boat, replaced with a Force 10 equivalent. Sure Marine in Seattle is a good resource for information or they can steer you in the right direction. That's it! Yes, it was the right element that worked while I was using the stove. I did notice the left element had yellow tape or something near the connection and the others had blue. I do have the manual I'll take a look at it. Maybe..... due to element power draw, certain combos will exceed the typical install wiring/breaker capability? See the note in the upper left referencing component "A." The model number is on the back. When you try to use all the burners and oven, remember 'load management'. In my case, the first breaker I open is the hot water heater. If that doesn't work, shut off a burner or two. Keep an eye on your AMP meter. On my 30amp boat, I have gotten used to resetting breakers. Do you still have the spit for the rotisserie? Mine was lost to time, but found one at a swap meet. I’ve made many a rotisserie bird while underway, and they come out fantastic. Nothing like just reaching the Anchorage with a cooked bird just finishing n the oven. My Nessie dog would bark at me when I slowed to idle through the anchorage , and be impatient in the time it took to pt the hook down, ultimately the main reason I learned to be efficient, lest I get yelled at further.